The first Catholics who lived in Leigh Park had no Church. They had to travel to St Joseph’s in Havant to attend Mass, not an easy journey in the days when few people had cars and there was no bus service on Sunday mornings. Many walked several miles to get there and the Parish Priest at St Joseph’s became increasingly worried about the difficulties they had to cope with. 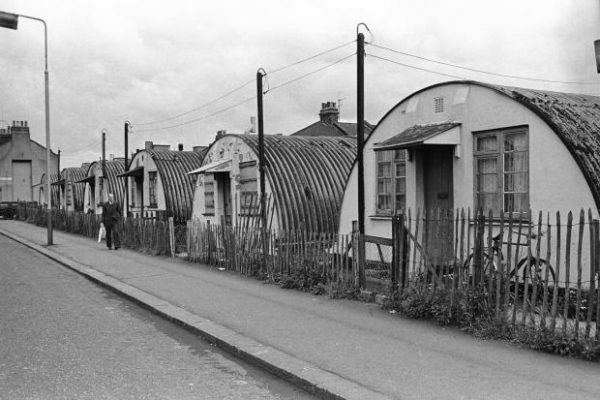 He arranged to rent a Nissen Hut in an old army camp near Riders Lane, and appealed to his parishioners for money to buy essentials, such as a Missal, for the celebration of Mass. On 9th December 1951 Mass was said in the Nissen Hut for the first time, and from then on it was said weekly on Sundays. During this time the Priests from St Joseph’s cared for the Leigh Park Catholics. The Portsmouth Diocese bought a plot of land in Dunsbury Way, to be the site of a Church for the future Leigh Park Parish. 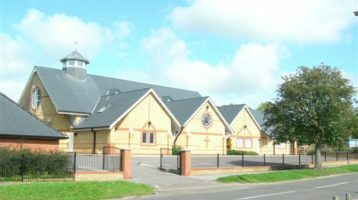 The Havant parishioners raised money to build a Hall where Mass could be celebrated. Building began in June 1954 and the first Mass was celebrated there on Christmas Eve 1954. On Ascension Day 1966 Leigh Park became a Parish in its own right, and Father Patrick Murphy O’Connor was appointed as the first Parish Priest. Until the Church and Presbytery were built he lived, together with his 2 assistant priests, at 458 Dunsbury Way (later to become Great Copse Drive). 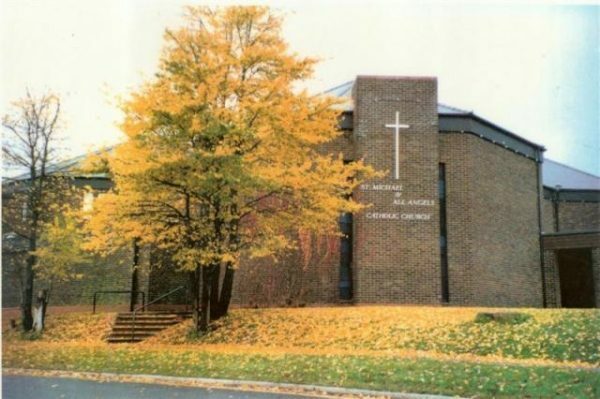 Building of the new Church, to be dedicated to St Michael and All Angels, began in February 1969. On 15th May 1970 the Church was solemnly blessed and opened by Bishop Worlock. The shell of the adjoining Presbytery was provided as part of the main building contract. In order to save money a team of craftsmen from the parish volunteered to do some of the interior work; at the same time another party of part-time volunteers started transforming the Hall, the first church building , to become the Church Hall. The parish thrived and took its place in the life of Leigh Park. And then, on 4th July 2001 without warning, a thunderbolt struck the Cross at the apex of the church roof. Within seconds the Church was ablaze. Miraculously, no one was hurt, but the Church and Presbytery were almost totally destroyed. Offers of help of all kinds poured in and were gratefully accepted. The Vicar of St Francis, the Anglican Church, offered the hospitality of their church for Mass on Sundays, and this arrangement continued for a few months while the Church Hall of St Michael’s, which had not been damaged in the fire, was made ready for Mass again. 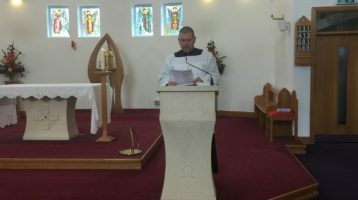 At this time, Father Jozef Gruszkiewicz, a Polish national who had been working in the Portsmouth Diocese for some years, was appointed, with the major task of caring for the parishioners and, with the help of a committee of lay people, to mastermind the building of a new Church and Presbytery. The triumphant success of the undertaking at the junction of Bramdean Drive and Dunsbury Way is there for all to see. The Church was opened by Bishop Crispian Hollis on December 18th 2004 and consecrated on February 2nd 2005. On the 4th July 2001 at around 10.30 AM, just after morning Mass had finished and Father Joe Keller and John Burridge were tidying things away, the top of the roof of the Old St Michael’s Church was hit by a lightning bolt that shattered the roof tiles and went to ground through the steel frame of the roof and the electric lighting cables, starting a rapidly spreading fire throughout the roof space. The church was quickly evacuated and the local Fire Brigade called, but the fire soon took hold and burned fiercely, necessitating a call for more fire engines from other parts of Hampshire. By about 2pm the fire was mainly extinguished but the fire engines remained for a few hours more, pumping water into the church and integral presbytery in order to dampen down the charred remains and prevent the fire restarting. With a gaping hole in the roof and much fire and water damage to the interior, the church and presbytery were both rendered unsafe and unusable. In the aftermath of the fire, the Parish, with the help of the Diocesan Surveyor and the loss adjusters at Miller Fisher, began to survey the damage to the buildings and their contents. The church and presbytery buildings were declared a write off, because the main church roof with its steel girders and frame was supported, not by a steel frame, but by brick walls, so that when the heat of the fire made the girders expand, they pushed the brick walls outwards at the top, rendering them unstable. There was only one solution: to tear the whole lot down, both the church and the adjoining presbytery. Thankfully, not everything in the interior was destroyed. In retrospect, probably the most important thing to have survived were accurate and detailed plans and elevation drawings of the old church that were produced when it had its new roof built to replace the previous flat topped roof. These subsequently proved vital in allowing our Quantity Surveyor to make detailed estimates of how much it would cost to rebuild the old church and presbytery. A quirk of UK taxation practice then worked to the advantage of the Parish. If the church were rebuilt as an exact replica, in effect a repair, then it would attract Value Added Tax at roughly 17%, whereas if a new church were to be built then it would attract no VAT, with a considerable saving to the Insurers in the order of £250,000. The Insurers needed no persuading that it was in their interests to agree to the building of a new church. 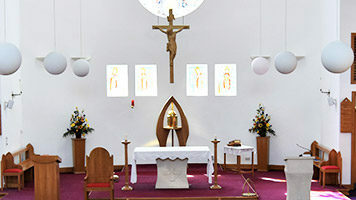 Over the next three and half years, the Parish, assisted ably by the Diocese and their Quantity Surveyor, negotiated a settlement with the Insurers and ran the project to design and build a new church and stand-alone presbytery, which opened for the Christmas celebration in December 2004, and then consecrated on the 2nd February 2005. The project was a remarkable success, delivering a fine church in such a short timescale within the budget approved by the Insurers, although not without sacrifice from the Parish. 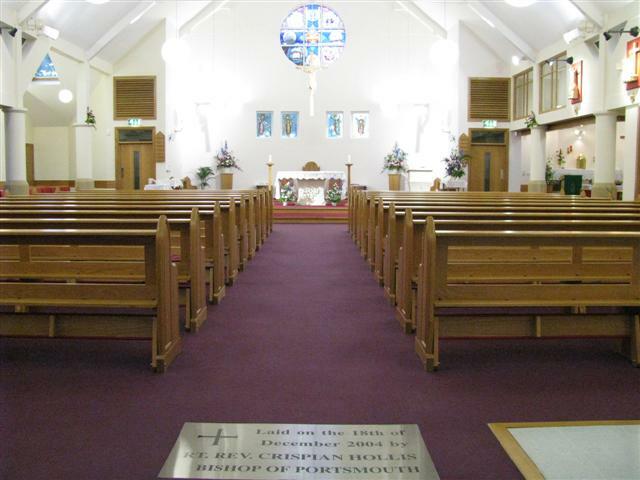 The purpose of these following web pages is to describe the process of designing and building a new church and to explain “our lessons learned”, so that other congregations wishing to build a new church or extend or rebuild their existing ones can see how the Parish achieved a notable success, for which our builder proudly received a major UK construction industry award in 2005. The first important step was taken to pray regularly by all parishioners so that God would bless this project, and all who were involved that they would have strength and a good motivation to serve the community. This prayer is still continuing in the parish especially to St Michael, who is the first Patron. The success of any building or engineering project is determined by engaging the right people and encouraging them to work in harmony as a team. This might seem like a statement of the obvious but all too often relationships between customers, designers and producers become strained and adversarial when great expectations cannot be delivered. The rebuilding effort at St Michael’s was blessed with having a strong and active Building Committee of 11 permanent members, who saw the project through from its inception in October 2001 to its finish in the spring of 2006. 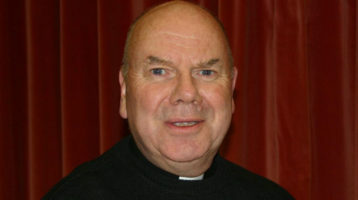 The Building Committee was formed at the invitation of the parish priest Father Jozef Gruszkiewicz, known to his parishioners as Father Joe, who was appointed as a parish priest in June 2001, when Father Joseph Keller put his resignation due to health reason and returned to the Liverpool diocese. Then Fr Joe, although new to the parish, applied to parishioners to come and share their talents in the Building Committee; some came forward and others nominated. Mrs Carole Maddock agreed to undertake the role as Chairperson, which she performed conscientiously and with much patience and good leadership skills. In the five years from the start to finish of the project, The Building Committee met over seventy times to oversee and direct the endeavour including the choice of the architects and the builders. 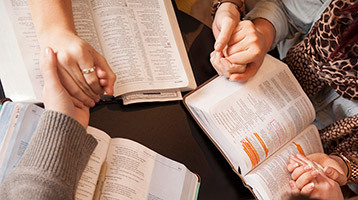 In addition, smaller groups (sup-committee) from our committee members met regularly with the officials of the Portsmouth Diocese to discuss finance, liturgical, external work, and with the Builders to monitor progress and make working level decisions. Every meeting, discussion and decision was carefully recorded by the Building Committee Secretary to the extent that the pile of committee files was several feet deep by the time that the project was completed. JB was knowledgeable in liturgical aspects and contributed to the design of the altar, font etc and led the procurement of fixtures and fittings of some liturgical items. AB was knowledgeable in matters of finance and company law, whilst able to contribute to the design, particularly of the stained glass windows, and garden. JM & CN were knowledgeable in church design and organised trips to see other designs of church in the Portsmouth Diocese, and belong to other sup-committee. DP contributed an initial sketch design, but unfortunately had to move from the area. BM was knowledgeable in practical aspects of project management and building and, during the Build Phase, he and Father Joe provided on the spot project management guidance to the builders on a day to day basis. They were also involved in the presbytery project which was finished earlier than the church. The ladies, CM, LC and JW, provided a feminine input on all aspects of the design of the church and its fixtures and fittings and décor including kitchen and furniture. PH, the Secretary, was also knowledgeable about the direction and management of large engineering and building projects, being an engineer and systems analyst by profession, a great help with reporting and preparing meetings. CM as Chair Person brought an expertise in people skills, and with Fr Joe when needed bringing other experts for consolation and a good advice. CM with a considerable experience in chairing community groups and leading groups of people from diverse backgrounds, which in retrospect proved crucial in allowing the Building Committee to run smoothly and function to its full potential. During the start up phase of the project, there was much debate over the need for a Project Manager to oversee both the Architects and the Builders. In practice, the St Michael’s project with a nominal building cost of about £1.3 milion, was not of such a size and complexity to make a full-time Project Manager necessary: that role was, in effect, performed by the Building Committee, but particularly Father Joe and BM on site with Christ as the Architect. In retrospect, the choice of the Quantity Surveyor, which was made by the Diocesan Surveyor, Sean Hayes, contributed more to the success of building a new church within the budget agreed by the Loss Adjuster and Insurers, than any other single factor. Our Quantity Surveyor, Malcolm Austen of Northcroft, was with us when the Diocese contracted him to manage the whole project, particularly with finance and correcting the project account agreed the financial settlement with the Insurers. Then, after a lifetime of working as a quantity surveyor and cost estimator, he retired. His experience was vast, and there was no-one better equipped to judge how much it would cost to build the new St Michael’s. The Quantity Surveyor’s first task was to estimate what it would cost to rebuild the old St Michael’s as it was before the fire. Luckily, the QS had quite detailed drawings of the structure and an accurate knowledge of its dimensions, upon which to base his estimates, but these drawings lacked any detail of the internal electrical and the mechanical engineering installations, and things like fixtures and fittings, which can be a high proportion of the costs. For some time after this initial estimate was made, the Building Committee was very concerned that the estimated cost of rebuilding the old St Michael’s was too low, and several fraught negotiating sessions with the Insurers and QS followed. Gradually, these cost estimates were revised upward until an acceptable figure was agreed by all parties, but the credibility of the QS and his estimates were crucial to this phase. With a figure for the rebuild of the old church finally agreed, it was then possible to set a budget for the new one. During the design phase, the cost estimates of the QS played an important role in the design feedback on affordability. At the time the project began, the widely accepted rule for the cost of building a church to house 300-400 people was about £1,000 per square metre of floor plan area. However, that is a nominal figure that does not take into account whether the structure is single storey, two storey or higher, and it hides the fact that the cost of electrical and mechanical engineering installations can vary widely, both in respect of the facilities provided and the charges of the electrical and mechanical contractors, as we were to learn later when the builder’s tenders came in. The lesson to be learned from this is that it is quite easy to estimate the cost of the bricks and mortar and roof for any design, but it is another thing entirely to be able to estimate, in advance, the cost of a detailed mechanical and electrical engineering design, and choice of equipment items for those services, and then what a builder and his M and E contractors would charge for installing them. The skill of our QS in foreseeing the spread of such costs between builders, and in pitching his estimates right so that the lowest tender came below them, was remarkable. Six firms of Architects were invited to come forward for interview by the Portsmouth Diocese in February 2002, in order to consider their suitability for designing the new St Michael’s. Of these six, the three best practices, Daniel Lelliot Krause, New Sarum Partnership and Massers were invited to submit initial concept designs at no cost to the Parish in a competitive design exercise to see what these firms thought they could deliver within the nominal budget of about £1.1M to £1.3M, and requirements provided by parish. In May 2002, the three Architects presented their concept design proposals to the Building Committee, and Daniel Lelliot Krause (DLK) were chosen unanimously as Architects for the project, by virtue of their experience, professionalism in presenting their designs, the appeal of their design concept, and their ability to demonstrate that they could get it built within the Insurer’s budget. Although some misgiving was expressed by our Diocesan advisor that the lack of DLK’s familiarity with the design philosophy of Roman Catholic churches might be a problem, it never turned out to be so, because of good sharing of liturgical knowledge by Committee. Neil Barr of DLK was appointed as the principal architect, initially supported by Richard Gale, but later assisted by Chris Whiting from the detailed design phase until the finish. Neil Barr and Chris Whiting both proved to be excellent choices and the Building Committee quickly formed a close and harmonious relationship with them that worked well right up until the very end. They listened patiently to our views and were extremely businesslike in producing drawings and specifications to the required timescales. The simple elegance of the design of the new church and the excellent functional utility of its many rooms and spaces is down to them. As regards lessons learned about the choice of architects, we came across some who had very high opinions of themselves and strong ideas about the form that new churches should take. We foresaw problems in getting on with them. In addition, architects whose ambitions for their structure and design novelty might have exceeded the capacity of their engineers and builders to deliver were perceived to be a dangerous gamble. We chose architects who could give us a simple rather traditional church design of real quality and it paid off. 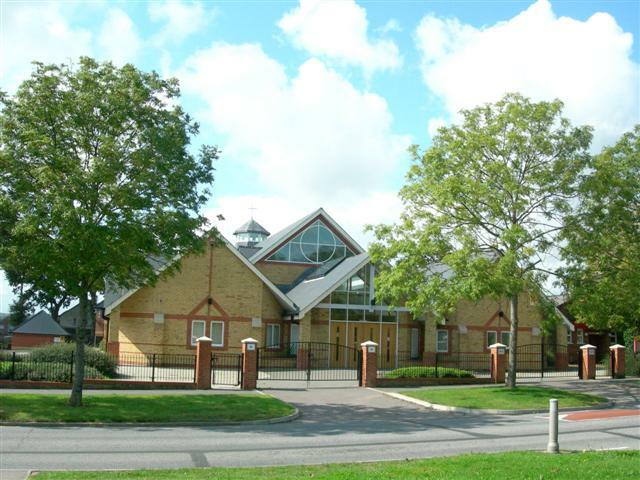 Later, in recognition of the quality of their design work on the new St Michael’s, Neil Barr and Chris Whiting of DLK were awarded Havant Borough Council’s Design Award for 2005. The Structural Engineers, Andrews Newby, and the Mechanical and Electrical Engineers, EDP, were both chosen by the Diocese without any interviews or competitive bidding. The structural design went well and was directed by DLK without much involvement from the Parish. The design of the mechanical and electrical systems, however, had much greater Parish involvement, and in retrospect, for such an important part of the design, the choice of engineers deserved more care. A number of builders from all over Hampshire were put forward by the Diocese and interviewed by the Diocesan Surveyor, Father Joe, the QS and the Building Committee Secretary. Of these, a short list of six was invited to tender in August/September 2003. From these tenders, BRYMOR of Waterlooville was selected as the best proposal, with the most realistic timescale and lowest cost, but within the Insurer’s limit. In addition, all the contractors were local men. However, there was more to the choice of the builder than the figures in the tender. We were impressed by the motivation of the people involved, from the Technical Director, Andy Townsend, down to the Project/ Contract Manager, Roger Halford, their Quantity Surveyor, Jamie Turpin, and their Site Foreman, Bob Oliver. When BRYMOR’s TD was first interviewed he said that BRYMOR wanted to do more than just build new supermarkets; he saw the opportunity to build the new St Michael’s as the firm’s first chance to build a church and an opportunity to make a lasting contribution to the social ambience of the Leigh Park area, giving its residents something to be proud of. This attitude of pride of workmanship permeated right down to the craftsmen working on site; they all wanted St Michael’s to be a monument to their best work, and so it proved. 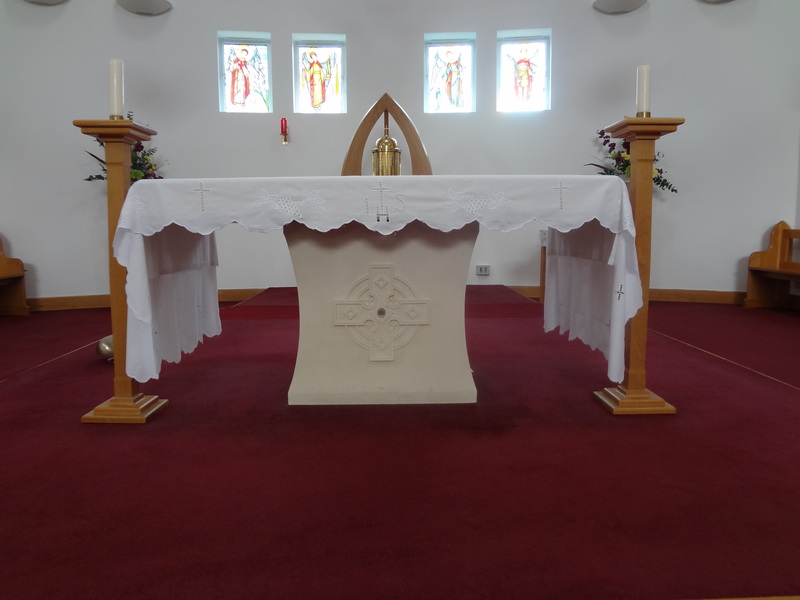 The suppliers for items like the new electronic organ, the altar and the font, the stained glass windows, furniture and so on, were chosen by the Parish, after careful consideration of a number of alternatives. All of this activity was ably led by John Burridge (JB) with the sub-liturgical committee, about which more will be said later together with pictures of the various items. The importance of the Financiers to a project such as this can never be understated. Without them nothing can happen. In this respect, the project was especially well served by the Diocesan Finance Officer, Mr Ian MacGrory, and the Loss Adjuster, Mr Steve Aldersley, who worked for CCIA Services Ltd, representing the Dioceses of England and Wales, who carried the first £500,000 and the three other re-insurers who carried the rest of the £1.3M plus fees, and £200.000 contents separate insurance. Although the Parish had no say in the appointment of these two officials, members of the Building Committee came to respect their inputs and essential fairness on matters regarding finance. During the progress of the project the Building Committee came to regard our Loss Adjuster as a valued member of the team, who could be convinced by fair and reasonable argument and compelling financial logic, especially if it was in the interests of his retainers. formulation of an Outline Statement of Requirements for the Architects to put forward their own concepts and ideas. 4.2 The Old St Michael’s was a huge brick-built barn of a building, big enough to house over 600 people. It was dull and uninspiring to look at and not much like a church; more like a public library with metal above heads. The Building Committee (BC) was of the view, after consultation with parishioners that it wanted the new church to look more like a church and be an inspiration to those who worshipped in it and a building that the whole of Leigh Park, a deprived area, could be proud of. 4.3 Initially the Old Church was built with a flat roof, which gave no end of trouble with rainwater leaks. Several years before the fire, the roof was redesigned with a pitched roof, but, because of the complicated ground plan, it was not a simple one; it had several sections sloping to adjoining gutters that had neither the capacity nor quality of design and build to carry the run-off from heavy rain, making the roof leakage problem even worse than it was before. The BC was determined that any new design should avoid flat roofs and have a conventional pitched roof of as simple a form as possible, with well designed and ample gutters. 4.4 Furthermore, the rebuilding of the roof of the Old St Michael’s left the Parish with a considerable debt to the Diocese, which at the time of the fire was over £40,000, and the Parish was struggling to repay that sum with falling attendance numbers, then around 200 for all weekend Masses. The BC was determined that the building of the New St Michael’s should plunge the Parish no further into debt, and, if possible, hopefully ease the debt situation. 4.5 In addition, the Old St Michael’s was known to have a problem with its rainwater drains, which, a few years before the fire, had flooded the Presbytery at considerable cost to the Insurers. The reason for this did not become clear until the Builders came around to relaying the drainage for the New St Michael’s and found that a carbon composite pipe drain, running from the Old Church to the main storm drains beneath the main road, had collapsed under the weight of heavy traffic running up and down Dunsbury Way. The BC was however mindful of the problem and the risks that this unknown posed for the budget. It was also a factor in deciding to go for a new presbytery well-separated from the new church and its storm drains. 4.6 The Old St Michael’s had several inadequacies under the heading of access arrangements: 1. the street corner site upon which the old church stood, although a fairly large one, was essentially open plan lawn and the space was not well used; 2. as a result, the amount of car parking was very limited; 3. the open plan nature of the site and the large amount of glass in the church doors made the church very open to vandalism; 4. the old church was designed without proper provision for access and use by the disabled, and the Parish faced a sizeable bill for bringing the old church up to the standards required by recent legislation. 4.7 As a result of the above inadequacies the BC perceived the need for: 1. a secure perimeter fence; 2. more car parking space within the perimeter; 3. improved building security arrangements to prevent vandals gaining entry to the building or access to the roof; 4. inherently greater resistance to vandalism damage in doors and windows at the ground floor level; 5. improved access for elderly and disabled parishioners, plus wedding parties and funeral corteges. 4.8 As regards the interior of the Old Church, many members of the BC and Parish felt that it was rather dark, with few windows and little natural light. It was also rather bare and lacking in warmth. Members of the BC felt that it would be better if the new church was significantly smaller in size, but of much higher quality, and that was the basic aim on which the design and building of the New St Michael’s moved forward. 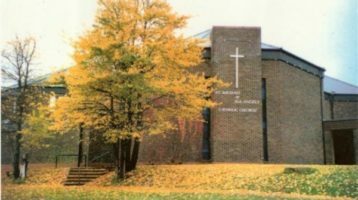 At its initial meeting in December 2001, the BC decided to conduct a survey of parishioner’s opinions on the sort of new church and facilities that they wanted. The Chairperson, Fr Joe and BM, produced a 2 page questionnaire, which was issued to parishioners attending Masses over the Christmas period, and a good response was obtained with around 60 replies, roughly one per household. The results of the survey were assembled for review at the next BC meeting at the end of January 2002. 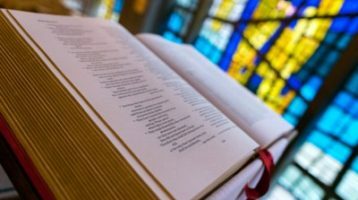 Although there was, as one might expect, a wide range of opinion, there was a strong consensus with the desire for a more traditional church design, and agreement that the new church should be a smaller building of higher quality. 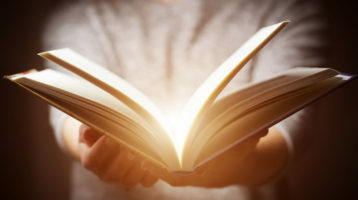 The essential results of this and the BC’s subsequent investigations are reported below in the section on Requirements. 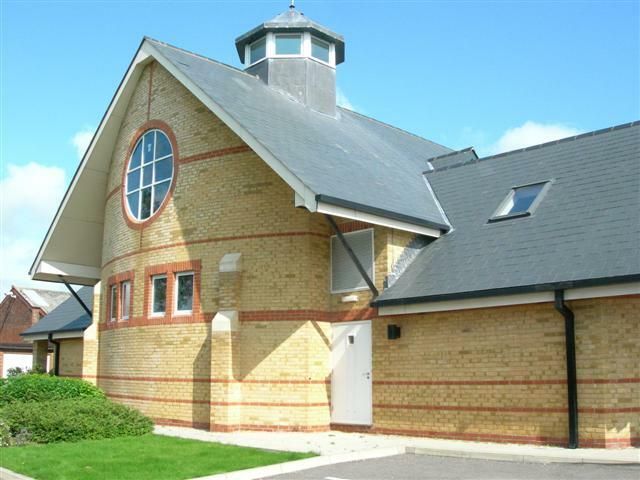 4.10 After the fire in July 2001, the local Anglican church of St Francis in Riders Lane invited the Parish to use its church for Sunday Masses, until the St Michael’s Parish Hall could be made safe and converted for use as a temporary church. During that period, when the parish was using St Francis, the St Michael’s parishioners got the feel of a more traditional church design, with a long nave, high pitched roof, and excellent acoustics. In retrospect, it is remarkable how this experience, subconsciously perhaps, shaped the views of the parishioners, because the New St Michael’s shares much in common with the best of St Francis. 4.11 On 16th January 2002, seven members of the BC spent a very full day visiting three other new RC churches in the Portsmouth Diocese: 1. 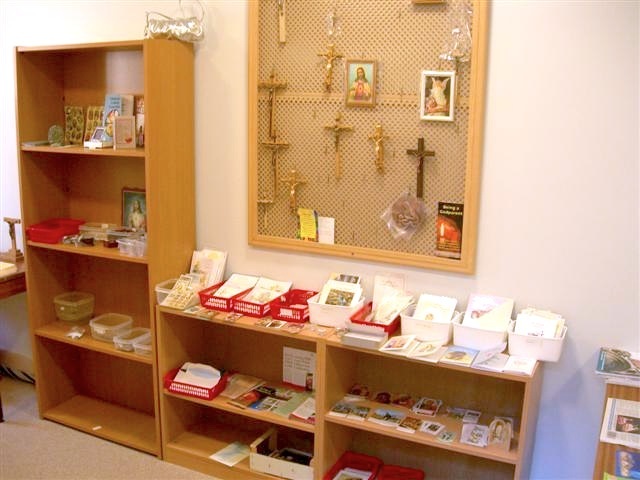 Our Lady Help of Christians in Farnborough; 2. The Immaculate Conception & St Joseph in Christchurch; 3. Our Lady Queen of Apostles in Bishops Waltham. 4.12 At each of the three churches, the members of the BC were very well received by the church architects and/or parish council members, and much was learned; too much to recount here in detail. Each church was of course different; constrained by both the nature of the site on which it was built and by the finances available. All were smaller than the New St Michael’s and had lesser budgets to work with. 1. At Farnborough, we were impressed by the technical knowledge and skill of the architects, the New Sarum Partnership, in particular the ambience of the interior, and the use of under-floor heating. 2. At Christchurch, we were impressed by the technical knowledge of the architects, but less impressed by the “in the round” layout of the worship area and the interior ambience. 3. At Bishops Waltham, we were greatly impressed by what had been achieved with a “design and build” project for a budget of around £400,000. It was a more traditional shape of church, with a Gothic period atmosphere, and single storey offices and parish rooms clustered around the main worship area. One feature that we saw, but didn’t like, was a modern bathing (immersed) pool baptistery. However, it gave us great hope that we could achieve a quality replacement for the Old St Michael’s within a budget limit of £1.3M. 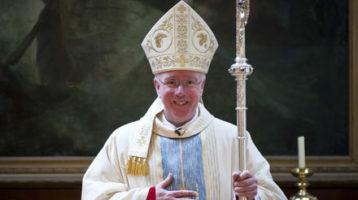 4.13 During the spring of 2002, the BC devoted a few sessions to meetings with the Portsmouth Diocesan Liturgical Advisor, Canon Alan Griffiths from Ringwood. These proved to be highly enjoyable and educational, and provided the BC with a grounding in the basic principles of good church design. The Canon also provided text books on church design for BC members to read at home, but best of all were his coloured slide shows of examples of good design for things like baptisteries, fonts, ambos and stained glass windows. 4.14 Apart from helping us to establish the layout and some of the basic dimensions for the sanctuary, worship area and processional aisles, the Canon identified a number of things as being particularly important for the spiritual feel of a church: • an imposing entrance, including a large main door; • the height of its roof; • the level of light; • the importance of warm and restful colours; • the importance of being able to see through the church windows to pleasant views of a green and peaceful outside world. 4.15 Following the completion of the survey and the visits to other churches and before going into the process of choosing the architects, the BC met once again to consolidate its requirements and come up with a basic design concept for the new church, which included a dedicated room for children’s liturgy and an infants’ room from which the main worship area could be viewed and accessed, plus committee rooms and an office and kitchen with a link to the existing hall. 4.16 In order to come within a budget of about £1.3M, the BC knew as a starting point that the new church could be no bigger than 1500 square metres in ground plan, on the basis that the crude rule of thumb for building costs was then about £1,000 per square metre; somewhat less for single storey units. 4.17 With that in mind, a couple of members drew up a simple basic plan of church with a long rectangular nave and cruciform worship area, flanked by an array of single storey spaces for chapels, sacristy, committee rooms, narthex, kitchen and toilets, and hallway linking to the Parish Hall. In retrospect, it is remarkable how close the final design was to this basic concept. 1. The church to be of a traditional style and have an essentially rectangular shape, with an internal worship area in a cruciform shape, and a sloping tiled roof. 2. The building to be built in brick to match the surrounding area and have a church (bell) tower. 3. The capacity of the church to be sufficient for 300 seated parishioners, with the main nave permanently capable of seating 200. 4. The interior to have a peaceful ambience and good acoustics. 5. The children’s liturgy room and infants’ room to be integral with the main worship area, so as to allow mothers and children to participate closely in the services, whilst allowing them access to other facilities and yet screening the main area from the noise and bustle of the younger ones. 6. The church to have a large porch area for welcoming and socialising after Mass. 7. Community rooms to be separate from the main worship area, but connected to the Parish Hall. 8. The exterior design of the church to be something that the whole of Leigh Park could be proud of. From such simple beginnings, the design of the church very quickly took shape, because the architects could see clearly what was wanted; so no time was lost going around endless design loops. 5.1 Setting a realistic timetable is a fundamental requirement for the success of any project. It is no good setting a timetable that is no better than a wish list, which does not make proper allowance for: • how long it will take to design the product; • how long it will take to build it; • how long it will take to make all the decisions involved. 5.2 For example: it took about 3.5 years from the time the Old St Michaels burned down to the time when the Parish was able to hold its first ceremonies in the New St Michaels, which was a remarkably short time by the standards of most other church building projects. about one year for the builders to build it. 5.3 It is clear from the above that proper allowance for the decision making processes is vital to setting a realistic timetable for the project. A few insights into the time required for the various key decisions follows. The first 6 months up to December 2001 was taken up with decisions with the Diocese and Loss Adjusters about how to proceed, culminating in the decision to build a new church. During this time committee of the parish was formed, and Fr Joe had several meetings with Diocesan QS and others advisers. The next 6 months, more or less, were taken up in selecting the architects: first down-selecting from 6 to 3 contenders in February 2002, then holding a design competition to go from three down to one, DLK. Then after a Feasibility Study & Sketch Design Phase lasting about 6 months, it took another 5-6 months to get Planning Approval from Havant Borough Council in May 2003. Then followed a Detailed Design & Specification Phase prior to requesting tenders in August 2003, after which it took another 4 months to decide upon the Builders and obtain financial approval from the Insurers. 5.4 Initially in December 2001, the BC had hopelessly unrealistic expectations that the new church could be completed by December 2003. Thankfully our architects and builders were much more realistic, and once our architects DLK had taken up the reins, their revised timetable slipped relatively little. 6.1 The Design Process began with the formulation of the Parish’s Outline Requirements and sketch of its basic concept, which was put to the 6 contending architects in February 2002, and it ended with the completion of the design drawings and specifications, plus the Bill of Quantities, which were sent out to the tendering builders in the beginning of August 2003; about 18 months in all. 6.2 The Design Process proceeded along the following steps: 1. A Concept Study Phase that involved the three preferred architects producing outline designs in competition and at their expense. 2. A 3 month Feasibility Study by the chosen architects DLK to examine feasible options within the budgeted cost agreed with the Insurers. 3. A 3 month Sketch Design Phase by DLK during which detailed drawings of plans and elevations were produced and then costed by the Quantity Surveyor. 4. 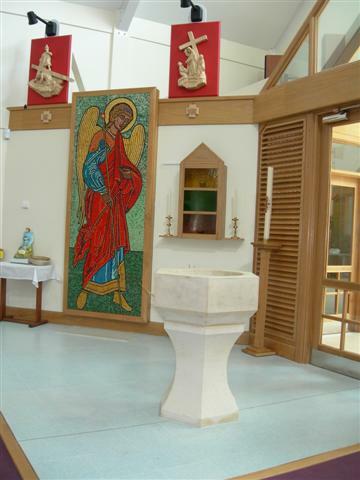 A 6 month Design Review Phase in which the preferred design was reviewed by the Diocesan Liturgical Design Committee, the Parish, and Havant Borough Council prior to it granting Planning Approval. 5. A 4 month Detailed Design Phase in which a Final Design was drawn up with detailed specifications and a Bill of Quantities for tendering. 6.3 The Concept Design Phase was a most worthwhile initial step that considered a broad range of ideas from the 3 preferred architects, but most important of all, it sorted out the architects that were prepared to put in the effort at their own expense to win the design contract and give the Parish what it wanted. 6.4 The Feasibility Study was an essential investigation into what the Parish could expect to get for its money, and it flagged up at a very early stage the problem of getting an acceptable design at a budget of less than £1.5M. Initially, DLK put forward three different design options but the BC very quickly homed in on one of those with an initial cost estimate of about £1.44 M. A more detailed assessment by the QS resulted in an estimate of about £1.7M, which the Loss Adjuster regarded as completely unacceptable. As a result the BC was forced to focus on how to get the costs down and how to persuade the Loss Adjuster that the budget was not enough. 6.5 The Sketch Design Phase worked on the detailing of the overall plan of the site, access arrangements, the exterior elevations and appearance of the building and its materials, and the function and layout of the interior rooms and spaces. In addition to the usual design plans and drawings, the architects produced a 3D cardboard model for display to the Parish and other interested parties, which was to prove well worth the small sum invested in it. When the design was revealed to the Parish on a cold dark winter evening, it met with much interest and approval. 6.6 The Design Review Phase proved to be an unexpectedly lengthy one, due to the number of third parties with a say in approving the design. Of these the Parish proved to be the most amenable and least problematic. The Diocesan Liturgical Design Committee could have been a major hurdle, but it wasn’t, largely because its Chairman, Canon Griffiths, was involved in the design from the start. 6.7 Obtaining Planning Approval from Havant Borough Council proved to be the most significant delay, not because its planning department was difficult or obstructive or inefficient, but because it was difficult to foresee which aspects of the design would become planning issues and how long it would take to resolve each one of these many minutae. In its guidance on planning applications and timescale for approval, HBC advises those seeking approval that it will take a minimum of 3 months, even if there are no objections. In our case, even though there were no major objections from the neighbourhood, it took 5 months to resolve all the issues connected with access, parking, trees, building materials etc. Although, most of these were quickly resolved in face to face meetings with HBC officials, it still took 5 months for written approval to come through, and until that approval was given, it was not prudent to put too much effort into detailed design. 6.8 The Detailed Design Phase was an exceptionally busy one for the architects and the consulting engineers and the members of the BC, because that was when all of the details of the interior design and specification of the electrical and mechanical systems, like heating and ventilation, were put on paper. On the electrical side this involved specifying the requirements for the lighting and power systems, the fire alarm system, internal and external security systems, the public address and music system, and the electric organ. 6.10 In addition, the Parish conducted a mock-up exercise in the Parish Hall for all the important rooms and liturgical spaces to assess the space available for fixtures and fittings and people. This trial involved all those in the Parish who were involved in the use of such facilities. As a result there was very little complaint when the building was finished and fitted out. This exercise also proved invaluable as an informal way of keeping key members of the Parish outside the Building Committee actively involved. 6.11 However, when the Builders were invited to tender, and even when they began building work, there were still about 40 minor design issues that were not fully resolved. It proved vital to the BC to keep track of all these issues throughout the Building Phase, to ensure that they did not cause delay to the programme or the costs to increase uncontrollably, and to make sure that each was dealt with in a satisfactory and timely way. 7.1 During the building of the New St Michael’s, the question of financing for the project was a matter of convincing our sponsors, the Diocese and the Loss Adjuster for the Dioceses of England and Wales and their insurers, that our cause was just, that we were not gilding the lily and that we were saving them money. 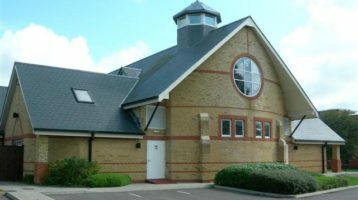 In respect of the latter requirement, we had to remind them constantly that we were saving them over £200,000 in VAT by opting to go for a new church rather than a rebuild of the old one. 7.2 In addition, the Building Committee was acutely aware of its responsibility to the Parish not to increase its debts, which at the time of the fire stood at over £40,000 to the Diocese, which was the amount outstanding from the £60,000 cost of putting a new roof on the old church. 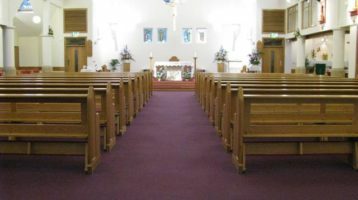 For several years, with falling attendance numbers at Masses, the Parish had considerable difficulty in making annual repayments to the Diocese to pay off the debt. The BC was absolutely determined that the building of the new church should not increase this debt. Initially there were hopes that the insurance payouts could be used to pay down the debt, but the Insurers would not allow that, the lawn was not insured. Thus effective cost control was vital to the project, and we succeeded. What follows is a simple explanation of how we did it. 7.3 Essentially there were 3 stages to the process: 1. Feasibility & Financing; 2. Detailed Design & Cost Reduction; 3. Building & Buying Affordable Fixtures & Fittings. 7.4 The Feasibility Study results proved crucial to convincing the Loss Adjuster to accept a more realistic higher cost limit, raising it from about £1.15 M to £1.3M. An initial aim of achieving a new church with 75 % of the capacity of the old one, holding 450 people, quickly proved untenable. Instead the Feasibility Study began with a capacity of at least 300, a floor plan area of 850 square metres and a budget cap of £1.4M. During this phase DLK looked at a number of options. The most favoured of these was reviewed by others committees, and it has been suggested several changes; the result was that the estimated cost rose to £1.724M. Knowing that this was way above the Insurers guideline, DLK produced a fallback design costing £1.55M. 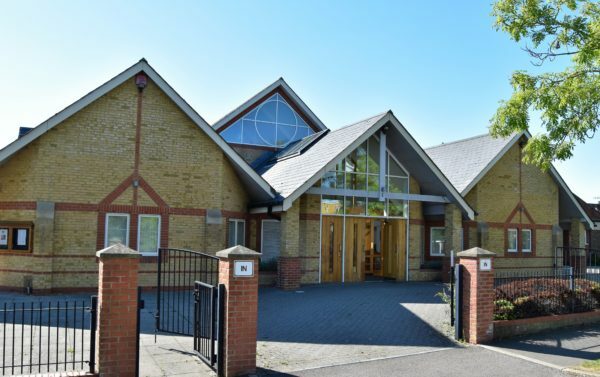 Subsequent negotiations with the Diocese and the Loss Adjuster agreed the Parish’s preferred option with a build cost of £1.3M as a goal, but put pressure on the Parish to find cost saving measures of over £80,000 to bring the costs down to that limit. These design and financing iterations took about 6 months, but it was time well spent, because basic financial viability was assured from December 2002 onwards. 7.5 During the Detailed Design Stage, the architects and BC looked at various ways to get the cost down to £1.3M and drew up a prioritisation list of areas for savings and debated how much might be saved in each area. At this stage the design of the main church building, with all its various spaces and rooms, as presented to HBC for approval was regarded as sacrosanct. Savings were sought elsewhere in the cost of the Presbytery and the landscaping, and in the M&E systems, in particular heating and ventilation. A redesign of the Presbytery with much less space saved about £50,000. However, despite these savings the process of detailing the M&E design and fixtures and fittings added further costs such that when the design was sent for tendering the QS’ estimated build cost total was about £100,000 over budget. In August and September 2003, we waited with bated breath to see whether any of the builder’s bids would come in under the £1.3M budget. 7.6 Thankfully, the bid from BRYMOR was within £12,000 of the budget figure of £1.3M, and so the need to go away and redesign and retender was avoided. Even so, the Loss Adjuster insisted that the Parish bear the cost of the £12,000 overrun, and that he, personally, would maintain control over the £50,000 set aside for contingencies. As a result of these strictures, once the contract with the builders was signed, the Building Committee asked the builders to put forward measures for detailed cost savings on specific items up to a total saving of about £30,000. This approach to cost saving and value engineering worked very well, because BRYMOR’s QS, Jamie Turpin, had considerable expertise to bring to the table, and a series of measures were taken to save over £20,000. This simple exercise ensured that the building cost would come in under budget, because, as it turned out, the building of the church was remarkably trouble free, with very few demands on the contingency funds. 7.7 With the Building Committee feeling very confident in the early spring of 2004, and building having already started, it turned its attention from worrying about the bricks and mortar to the outstanding problems of purchasing the basic ecclesiastical fixtures and fittings, such as the altar, ambo, font, organ, music and sound system, stained glass windows, Stations of the Cross, and so on. Within the budget of £1.3M, the QS had made a provision for some of these items, known as the Provisional Sum, amounting to £72,000. Yet in February 2004, the Building Committee totted up its own estimates for these and other items and came up with a prospective total bill of £200,000. Such a serious shortfall required a number of funding lines to resolve it. 7.9 The story of how this money was spent wisely is told in more detail in Section 9, but the essential point here is that the BC ensured that the project came in on budget by great attention to detail on a host of items. There is no other way to do it. 8.1 The building phase began on 19th January 2004 and 11 months later the new church was ready for an inaugural service on 18th December that year. However, it took another 3 months of work by a small on-site team of builders to complete all of the work necessary to bring the fitting-out up to a satisfactory standard, default lists were prepared by the BC and Architect. 8.2 During the first 6 months, the builders marked out the site, dug the foundations and erected the steel frame and brick walls, before putting the roof on in mid summer. At the start of the work in January 2004, the BC was concerned about the possible disruption of work by bad winter weather, but the project was exceedingly fortunate in that the number of working days lost to bad weather was less than a week. Thus, during the first half of the year, the work progressed to schedule, more or less. 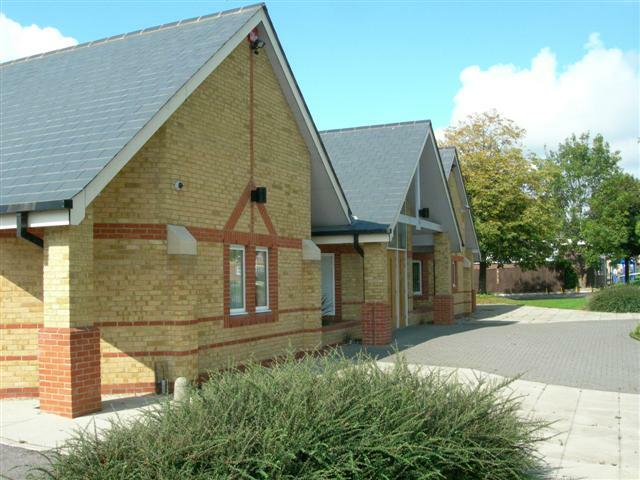 8.3 The first thing to be completed in August 2004 was the new Presbytery, which was initially planned for completion in July 2004, but difficulties with electric cables and the gas suppliers in getting it connected to the mains delayed moving in. 8.4 From the August onwards, once the new church had its roof, then work started on the fitting out of the building with its M&E systems, doors and windows etc, and during this stage it became apparent that the building schedule was in no way detailed enough to reflect the amount of work to be done and the many interactions and intricacies of the trades and jobs involved. At that stage, progress control was in the hands of the Site Foreman, who did a splendid job, plus a multitude of tradesmen under contract. Given the magnitude of the fitting out task and the lack of detail in the fitting out plan, it is no surprise that slippage took place, such that as November began, it became clear that the planned handover date of 15 November could not be met. 8.5 What is remarkable is that at that late stage, the slippage was contained to about one month, so that the church was ready for use in time for the Christmas services and festivities. By that time, the Site Foreman was exhausted, having had no holiday for over a year, so he, having already booked a holiday prior to the Christmas break, was allowed to take a well earned break. At that point, the BRYMOR Contracts Manager, Roger Halford, stepped onto the site and rolled up his sleeves to act as foreman. 8.6 During the final two weeks of fitting out, the BRYMOR Contracts Manager and members of the Building Committee were on site every day, checking on outstanding issues that stood in the way of moving in. At the very end, only electrical safety issues remained in the way of the building being certified safe for public use, and once the precise nature of these problems was ascertained with the Professional Electrical Engineer, then they were swiftly rectified by the electricians. 8.7 A major lesson to be learned here is that toward the end of the fitting out phase, there are many small problems to be resolved, and if you wait for them all to be resolved satisfactorily by normal hands-off liaison and procedures, then it would take many months more. We on the St Michael’s BC did every thing that we could to ensure timely co-ordination between the builders and professional engineers, and to instil a can-do attitude to help find ways of working around each and every problem. We and the builders are very proud of how we worked together to make it happen in time for Christmas 2004. It was one of the key factors that resulted in Roger Halford winning a UK National Construction Industry award for his exceptional performance. 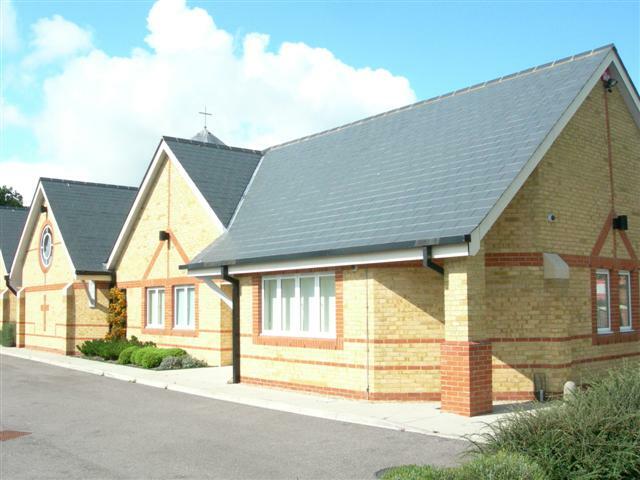 A Community Rooms & Presbytery Sub-Committee led by Carol M, which dealt with fixtures, fittings, furniture and appliances for the Kitchen, Office, Committee Room, Narthex, Lobby & Link. Presbytery Sub-Committee with leading Brain M and Fr Joe. Making sure that the product and builder’s fitting costs were in budget. The design work for the altar, font and ambo was done by John B. Photos show the finished products, supplied by Hughes Masonry for a cost of about £15,000. The choice of supplier was made after visits to the Cathedral Stone Works at Chichester and Hughes Masonry at Bognor Regis to see the quality of the craftsmanship and to discuss the choice of stone and likely costs for each item. Hughes Masonry was chosen as supplier for being able to meet the BC’s budget and timescale requirements and the Parish’s preference for local tradesmen. As the reader will see from the photos, the quality of the stonework and carving is excellent. The outline design work for stained glass in the three largest windows in the church was done by Arthur B, Colin N and Father Joe. Initially, at the suggestion of Colin Newman, the BC considered whether to use “coloured film windows” rather than traditional stained glass, because it was said to be much cheaper and lighter in weight. But after visits to the Sacred Heart Church in Bordon and a chapel in a Cheshire Home near Petersfield, the members of the BC felt that the film colours were too strong and garish and that it was difficult to get convincing detail into human faces in particular. Traditional stained glass techniques allow much more subtle colouring and detailing, especially when we want symbols in all stained glass. Also, because “coloured film windows” are much less expensive, there is the temptation to put “coloured-film” into every window, and that leads to far too much garish colour and too little natural light, with some weird effects in strong sun-lighting. The initial idea was to have stained glass in the windows of the Sanctuary, Lady Chapel and the Narthex too, but for reasons of insufficient structural strength, difficulty of access and cost, the requirement to put stained glass in the Narthex window was dropped. The detailed design and choice of colours for the Sanctuary and Lady Chapel windows was done by Mrs Jude Tarrant of Sunrise Stained Glass. The BC visited their works to see the detailed designs and agree the choice of colours. As the reader will see from the photos, the resulting windows supplied by Sunrise for the Sanctuary and Lady Chapel provide lovely interior views and effects in strong light at evening time and mid-day respectively. The cost of these two windows was roughly £19,000. In 2006, one year after the new church was completed and with limited funds remaining, Father Joe initiated steps to obtain nine small stained glass windows from Poland for the lower windows in the Sanctuary Wall, the Blessed Sacrament Chapel, and the Choir. A separate Liturgical Committee for New Projects was formed to oversee the design and purchase of these windows from Poland and a number of other projects. The designs for these windows were done in part by Father Joe and John B, with the help of the committee, and in part by the Polish designers and manufacturers FURDYNA, some representative visited their work in Krakow. The four lower windows in the Sanctuary show St Michael the Archangel, plus the Archangels Gabriel, Raphael and Uriel, based on designs originally developed for the large Narthex window. These allow a significant amount of see-through and natural light, whilst blocking out the distracting views of the Presbytery and trees. The 4 windows in the Blessed Sacrament Chapel show symbols for the 4 evangelists, Matthew, Mark, Luke and John. These windows are north facing and designed to block out completely the unsightly view of the side of the Church Hall and backyard behind the Kitchen. The design of these windows proved the most difficult challenge, with size and colures. The window behind the Choir, showing musicians, angles and children, it is the most vibrant and successful of the nine smaller windows. The Carved Crucifix over the High Altar and the Stations of the Cross, were manufactured in Poland although ordered by one of the company in England. Previous Stations of the Cross were a bit big for the new church and the cost would be more to repair then buy new. It was decided that new will be design. The bench seating for the main nave and the 120 chairs for the Lady Chapel and Blessed Sacrament Chapel, and the Choir, were supplied by Hayes and Finch of Liverpool for a cost of £22,000. A number of ecclesiastical furniture suppliers in Britain and the Republic Ireland were contacted by John and asked to provide sample catalogues and quotes. After a visit by Carole and Brian to see Hayes and Finches products at their works near Liverpool, the BC came to the view that Hayes and Finch should be the chosen supplier because of the extremely good quality finish of their work and the comfortable nature of a sample of seats, and their competitive quote within our budget. The old pipe organ was destroyed by the fire and the subsequent drenching that it received from the Fire Brigade and replacing it would have cost over £250,000. Unfortunately it was inadequately insured to a limit of only £53,000, so a one –for-one replacement was out of the question. 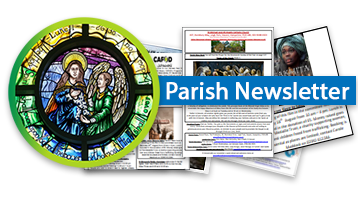 The Parish was advised to consider a good quality electronic organ with a budget of £12k – £15k. The new organ, supplied by Abinger Organs, was chosen after JB had contacted a number of suppliers and arranged a visit by members of the BC to St John the Baptist RC church in Andover, which had such an organ installed. As the reader will see from the photo, the new electronic organ looks much like the old one, but without the pipes, and to all intents and purposes it plays and sounds like a very powerful pipe organ; its tones having been set to electronically voice the sound of one of the major pipe organs of England. It was supplied at a cost of about £15,000. The public address, sound and music system in the old church included a microphone and loudspeaker system, with a magnetic loop system for the hard of hearing, plus a tape player; all of which was destroyed in the fire. The new public address, sound and music system was supplied by Solent Sound & Fire Systems of Hamble, near Southampton at a cost of about £14,000 plus £900 for extras, excluding the cost of the magnetic loop installation. 9.4.1 A summary of items for the Community Rooms & Presbytery is provided below with nominal budget figures to give the reader some idea of the cost of fitting out each one. Although the kitchen of the old church was large enough for making and serving tea to small numbers after Mass and at church fairs and fetes, it was too small to cater for large functions in the Church Hall and larger gatherings in the church. Also it was dark and dingy and poorly ventilated for cooking on a large scale. The kitchen of the new church is strategically positioned at the side of the Hall with a second hatchway into the Link, so as to be able to serve tea and coffee to people in the Link after services, as well as to serve larger functions in the Hall, such as weddings, parties and dances, for over 120 people. It was designed to be comparable to a kitchen for a small hotel and allow full food preparation on the spot, and/or use by caterers bringing in food prepared elsewhere. The budget for the kitchen units and fittings was about £10,000, although Houghtons of Farlington were able to supply a set of kitchen units of excellent quality for less. Another £5,000 was spent on appliances, including a high speed dish washer and utensils, crockery and cutlery. The kitchen has proved to be a great success and an excellent investment as it allows users of the Hall and Committee Rooms to cater for all day and whole-week courses, which yield enough income to pay the annual gas and electricity bills for the whole church. The Committee Rooms in the old church were located in the ground floor of the old presbytery and they were very cramped. The new Committee Room is much more spacious and allows seminars of up to 40 people to take place with integral coffee and tea making and small scale catering facilities. It is well heated and comfortable throughout the year, day and night, with a pleasant outlook. In addition, the Children’s Liturgy Room nearby can be used as another room for teaching sessions or small syndicate work or one-on-one private conversations. The office furniture of the Committee Room was supplied by Claires of Waterlooville for a cost of about £1700. 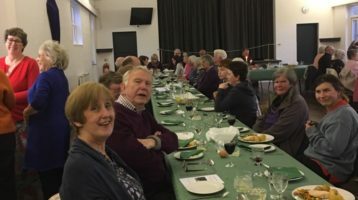 The new Committee Room has been a great success, not only in allowing groups of the Parish to meet in pleasant circumstances, but also in allowing the Social Services departments of the Havant local authority to hold courses and seminars, which has generated a good deal of income for the Parish. The office of the old church was a very small room tucked away in the ground floor of the old presbytery and very inaccessible. The new one is much more spacious and modern with carpets, furniture and up-to-date office equipment supplied by Claires and Staples for £3,500. In the old church, the Narthex was a very large area that served many useful functions. On grand occasions it provided an overspill seating area looking into the main worship area. In addition, it was popular for congregating and socialising after Mass, with teas and coffees served from the adjacent small kitchen. It was also of great use for fairs and fetes, especially when the weather was too bad. With the reduced ground floor area of the New Church, the BC was keen that a large Narthex should be retained and that the whole area of the Narthex- Link-Hall could still be used for fetes and fairs as a single walk-through area. Toilet and washroom facilities are adjacent to the Link. In addition, the Link has an entrance to the Sacristies, so that, if the weather is bad, then a grand procession can make an entrance to the church through the Link. The new facilities have enhanced the advantages of the old church and are a great success. The costs of fitting out the Narthex and Link with notice boards, furniture etc were just £500. The old presbytery was integral with the old church at the south corner, built on three stories and not overly spacious. With its drainage integral with the church, and being at the lowest point, it flooded when the drains could not cope with a torrent of water from the church roof. The new presbytery was relocated at the southwest corner of the site and built as a separate building with its drains running down into the top of Bramdean Drive, rather than into the main drainage of Dunsbury Way. This has allowed much better utilisation of the overall site. The original design for the new presbytery, with its lounge – dining room, meeting room, offices and three upstairs bedrooms and sitting room, was much more spacious than the old presbytery with an estimated building cost of about £210,000. As a result of cost overruns, the design had to be downsized to a more typical detached house of about £180,000. Despite this, however, the new presbytery has proven to be a good design, except the study room, which is too small. Fittings and furnishings for the new presbytery cost roughly £24,000 divided as follows: £4000 for carpets; £3000 for the kitchen appliances, utensils, crockery and cutlery; £3,500 for the office; £3,000 each for the lounge and meeting room; £1,500 for the dining room; £1,000 for each bedroom. Much of this was supplied by local companies. Although the original site was quite spacious, it was open plan and much of it was grassy lawn, with a very small area for car parking. The new church, with its smaller ground plan area and rectangular shape has allowed much better utilisation of the site with parking for up to 40 cars. At the stipulation of the Havant planning authorities, part of the parking area is given over to “grasscrete”, which is a clever way of greening over large areas of hard standing for car parking that uses porous concrete blocks, through which grass can grow. It works well, even in winter. The total cost of the groundworks for the parking areas, paved areas and paths, plus the ceremonial driveway and perimeter wall was in excess of £1,000 and the cost of planting with shrubs and turf was another £3,000. In addition, with funds raised by the Parish, the green spaces at the rear of the church have been given over to a memorial garden, which has been a great success. Many parishioners say that it is so nice to sit there on a bright and sunny day, and to enjoy the flowers and old memories in peace and quiet. The old church was very open to vandalism by virtue of its open plan site and the ease with which its doors and windows could be approached and its roofs could be scaled. The new church has a stout perimeter wall and iron railings, which are difficult to scale but avoid looking fortress-like. In addition, considerable care has been put into the detailed design of the drainpipes, walls and rooftops to prevent them being scaled by opportunist vandals. As a second layer of defence, both the exterior and interior of the church and presbytery are scanned by CCTV 24/7 with PIR lights to illuminate any intruders after dark. In addition, there is a separate intruder alarm system, and the interior of the church is also divided into separate zones via stout doors and locks. To date this combination of measures, which was put together with the aid of Hampshire Police, has been very successful. The building of the New St Michael’s was an exceptionally successful project by any standards, which was made possible by the following. (1) The formation of a small, but effective, Building Committee of 12 people from the Parish, who brought with them appropriate expertise, talents and total commitment to the project, with clear avenues of responsibility for named persons, plus an agreed reporting mechanism, provided an essential nucleus. (2) The establishment of sub groups, each with its own chairperson, on finance, design, building and purchasing of fixtures, fittings and appliances, enabled the committee to define its requirements, negotiate with the architects, builders and financiers and monitor progress in a manageable way. (3) The regular manger meeting of the BC, over seventy times in five years, 400 other meetings all told; and the use of active communication between all parties involved, by phone, e-mail, written minutes of meetings and normal correspondence by letter, greatly helped the smooth running of things and kept slippage to a minimum. (4) The involvement of the Parish from the start with a survey of opinion on what the requirements for the new church should be, plus regular updates and consultations regarding the progress of the build and choices to be made, ensured that the parishioners were given a real say in the nature of the new church. This included verbal presentations with the architects as well as the building of a prototype model plus photographic displays, and interactive participation in mock-up exercises. 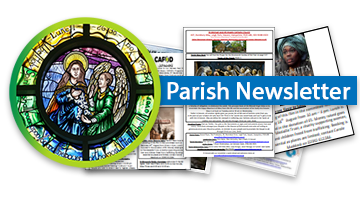 Articles were also written in the parish newsletter, diocesan magazine and local newspaper so that the wider community also felt involved and could see that real progress was being made. (5) The securing of an adequate level of finance at an early stage was vital, as was the knowledge of roughly how much it would cost to build a new church of the sort that the Parish wanted. The appointment of a very experienced Quantity Surveyor to work with the Parish from the outset was vital to the success of the project. (6) The motivation of the architects, builders and craftsmen in wanting to build a fine church as a monument to their work, and to work as a team, was a crucial factor in delivering the project in a remarkably short timescale and within budget. 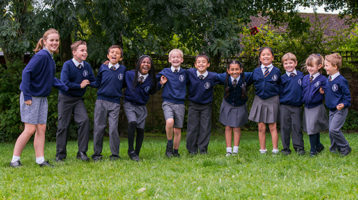 Their fine achievement has been recognised at both local and national level. (7) The successful management of expectations, in particular the need to be realistic about timescales and how long it takes to do things, proved a most important aspect of project management. From the time when the Old St Michael’s burned down, it took 3.5 years before the first ceremonies were held in the new church, of which one year was taken up in design and another year in building. The remaining 1.5 years was the time that it took to make all the decisions involved in choosing architects and builders and getting the financial approval required. Finally, it must be said that the project was not all plain sailing. Although every meeting we prayed for the graces needed to create a new church fitting for God, there were many challenges and hitches, and sometimes we had to “go back to the drawing board”. However the spirit to succeed and find ways around every problem prevailed at every level, right down to all people involved. For all that – Thanks Be To God.